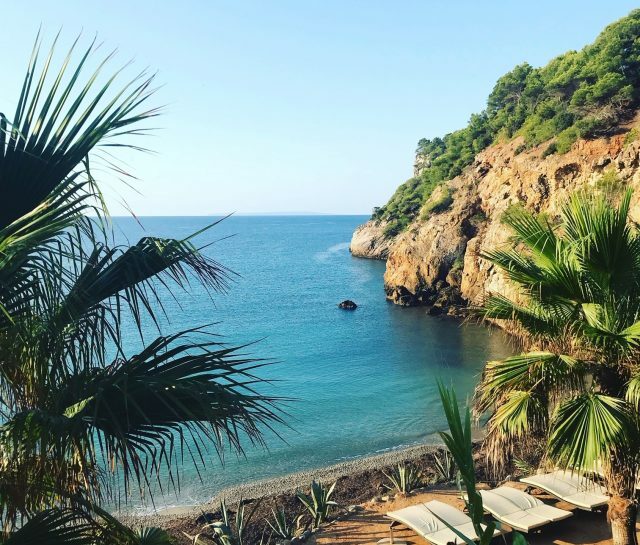 Surrounded by rugged cliffs, fragrant pine trees and turquoise waters, Cala Jondal has long been renowned as one of the best beaches on the island. It tends to attract the cool crowd who come here for the trendy beach bars, such as Blue Marlin, and the all-year-round restaurant, Yemanja, which is a favourite with the locals. One of the most renowned resorts of Ibiza, Playa d’en Bossa (PDB) is home to iconic clubs, a lively international crowd and one of the island’s longest beaches – plus a great beach club, The Beachouse. You will also find an amazing array of local bars with good vibes, restaurants that have Menu Del Dia delights and plenty of shops for a new bikini or bat and ball for the beach. PDB also played host to Bora Bora – one last little slice of the clubbing institution that was born around the same time as the iconic space that has now become Hi Ibiza. Set against a beautiful backdrop of sand dunes, the far right-hand side of Es Cavallet is one of Ibiza’s official nudist beaches – though stripping off is not obligatory. Popular with the fashionable crowd, you’ll also spot the occasional celeb at the excellent beach club, El Chiringuito – and, to the far left, La Escollera provides some incredible local seafood. Las Salinas is a vast expanse of silky sand located next to a protected nature reserve and also the best spot to catch a boat to Formentera. For an iconic Ibiza moment, lie back and listen to the DJs spinning the Balearic beats at the Jockey Club, as the sun slips below the horizon, or drop into the nearby Experimental Beach for sundown cocktails. Head to the far left of Salinas for a more relaxed affair at Sa Trixa, where you can always catch a good island DJ, and have fun jumping off the end of the little pier. This rugged spectacle was created from the stones that were once carved out to build Dalt Vila’s old town – a UNESCO World Heritage Site. Close to the small rocky island of Es Vedra, some believe it has a special magnetic force. In any event, it’s worth the steep descent for its distinctive rock formations, hidden cave and natural sea pools. Just be sure to find yourself a flat rock for sunbathing – or take a Lilo! One of the best-loved beaches on the island, Cala d’Hort offers beautiful views of the aforementioned Es Vedra. In addition, you will also find excellent snorkelling, some gorgeous seafood restaurants and a great little boutique if you feel like finding some island boho fashion to fully embrace your white-isle chic. 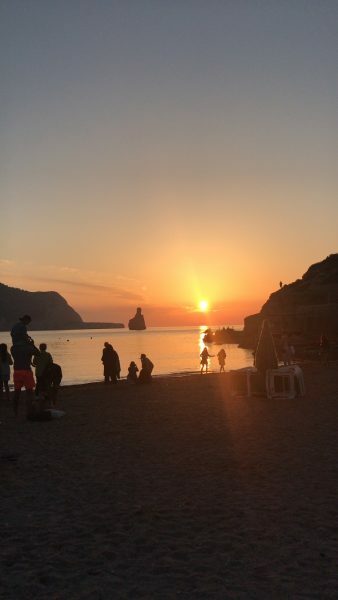 A favourite beach for watching the magic end-of-the-day spectacle, head to Sunset Ashram for a sangria and some incredible live local music or DJ Jon Sa Trixa spinning the discs. Offering picturesque views over neighbouring islands, there are also two stretches of sand, and the many rocky outcrops make it a good place for snorkelling. In addition, Cala Conta is a firm favourite with island locals for picnics in winter. 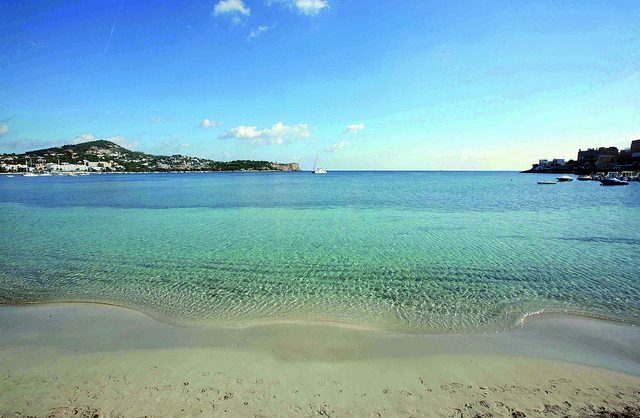 A popular swimming spot, thanks to its beautiful turquoise waters, this sandy/pebbly beach is tucked away on the western coast of Ibiza. There is also a great pop-up beach bar here that is renowned for its excellent eco credentials and mouth-watering menu. Meaning “white water”, the name Aguas Blancas refers to the choppy white horses caused by the sea breezes. However, this nudist-friendly beach has one of the best chirringuitos for a margarita or sundown mojito, and you can also use the cave dust, mixed with a little water, for an amazing face pack or body scrub. Something of an institution on the island, be sure to catch the legendary Sunday sunset with its drumming circle and dancing hippies (also most evenings during summertime). Get there early to avoid the congestion and grab yourself a spot for your picnic blanket and bottle of ice-cold Cava. This idyllic beach also offers three top-notch seafood restaurants or a more casual pizza parlour. Then there is the fab hippy market on Sundays (and most days in peak summer). Found on the northern tip of the island, the popular beauty spot of Portinatx comprises three sandy beaches all with translucent waters. 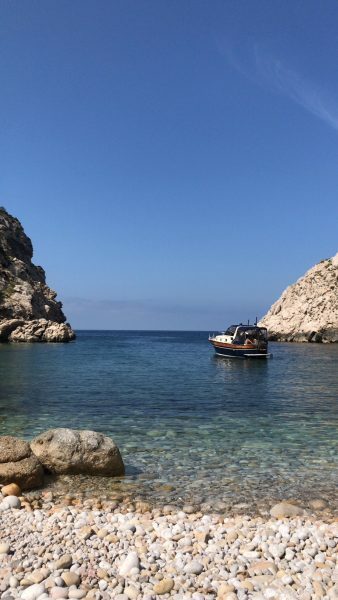 Each has its own charms, but we particularly like Playa Porto, which is found in a little cove close to the lighthouse. Here you will find the best chiringuito cocktails and our favourite sunset views from Los Enamorados – aka the Lovers’ Restaurant. While it may not be a beach in the technical sense of the word, the beautiful bay of Punta Galera is well worth a visit for its distinctive flat rocks, which make perfect platforms for sunbathing, as well as the spectacular sunsets here. The surrounding rock pools also make this a popular destination with snorkellers. If you’re a fan of water sports then this is the place to come, with sailing, kitesurfing and a diving school, plus a great sandy beach. There is also a popular ‘hippy’ market every Wednesday in nearby Es Canar. The after-market party always kicks off at Chirincana on Cala Martina where you’ll find a taste of real local life, not to mention the best barefoot dance floor. A stunning spot for snorkelling, Pou des Lleó is known for its crystal-clear water. It is also surrounded by red cliffs on one side and boat sheds on the other, creating a perfect little haven with a beautiful backdrop. There is a small chiringuito on the beach and two restaurants nearby that are popular with locals. Just 15 minutes’ walk along the marina from Ibiza Town, the picturesque bay of Talamanca offers a gorgeous sandy beach that is a particular hot spot for islanders. Adrenaline-junkies can also up the pace with a spot of cliff jumping at nearby Sa Punta. The Fish Shack next door is also a huge hit for its fresh daily catch served up with a rare Ibiza no-frills approach that’s both refreshing and delicious.